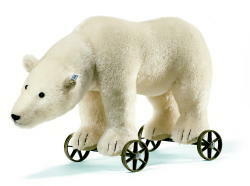 17", 2006, An exact replica of Steiff's white mohair polar bear on wheels from 1910. He has a patented ball joint neck which triggers a growler when moved, excelsior stuffing, custom black glass eyes. On metal frame with four metal six spoke wheels.